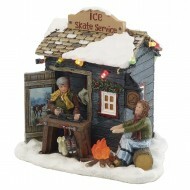 Jefferson was sharpening Adele's skate, while she warmed herself by the fire. L11.5 x w9 x h11cm. Re..